HAKEL Spol. S. R. O. since its establishment in 1994 is a major producer of surge protection devices in Europe. The company obtained ISO 9001 certificate in 1997. The production of surge protection devices is a specific and technical area with great demands on professional knowledge of the company‘s management as well as the production and research staff. Introduction of new technologies and using the latest testing equipment enables engineers to extend their technical knowledge. The use of surge protection devices is becoming a common necessity nowadays. Large power systems, which are operated by complicated electronics are more and more sensitive to electromagnetic and over voltage damage. Failure of electronic equipment owing to surges can cause reduction of orders or even company‘s bankruptcy. Surge protection devices produced by Hakel company can be easily applied in every industry, domestic, commercial and industrial. Hakel company also passes its experience on to college and university students and helps them to acquaint with new solutions in electromagnetic compatibility. Experience obtained from working with power electronics in industry are closely related to the company‘s market leading position in the Czech Republic (Europe). HAKEL exports products worldwide through its partner companies which it has helped to train and develop their mutual businesses. The surge protection product range offered by Hakel enables customers to easily apply the products in every industrial, commercial and domestic situation. 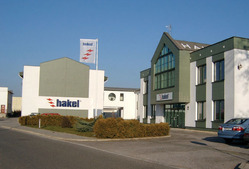 The continual, investment in new technologies and product development helps Hakel to achieve higher standards and better technical solutions than its competitors. That is one of the reasons why Hakel is a world market leader in the field of surge protection. All HAKEL products are tested according to the most up to date international and European standards which include EN61643-11 and IEC61643-1. HAKEL spol. s r.o. produces and exports to countries on all continents important safety products (SPD), insulation monitoring devices, these enable users to improve their safety in ungrounded IT power supply systems, railway, engineering, shipbuilding, hospitals and transport facilities.